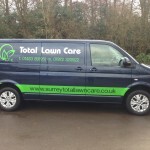 Surrey Total Lawn Care Ltd is a small local independent business (based near Guildford in Surrey), run by people who genuinely care about your garden and your lawn. It is our aim to find out what you need from your garden so that we may help you achieve the quality of lawn that suits you! For example – Do you have children and pets playing on your lawn; or are you looking for a lush green striped lawn? After all, everyone is different, as is their garden and what it is used for. We at Surrey Total Lawn Care, offer a full range of services, from a complete annual lawn care program, to major lawn replacements and everything else in between! Our aim is to help you create a lawn you can be proud of and enjoy on a day to day basis. We also feel it is very important to show you the customer, how you can help us to help you. As when it comes to lawns, simply doing a few things slightly different can make a big difference. for example, knowing when to cut the grass and how short to cut it, can be the difference between a healthy lawn and a tired looking one. …because we know lawn care isn’t as easy as it’s cracked up to be! Proudly caring for lawns in Surrey since 2009, Total Lawn Care is an independent professional lawn care and grass cutting company. Because we are independent, we feel that we can offer a better service at a better price than that of our franchised counterparts. We are local, so our workmanship is the strength of our business, and your guarantee that you will receive a service of a high standard from people who actually care about you and your lawns.